The unfolding political crisis in Akwa Ibom State, one of the big oil states in Southern Nigeria that has been relatively very peaceful till the advent of a seeming czarist regime in 2007, could trigger off some dangerous economic consequences for Nigeria if not contained urgently. Though what is playing out in the state is being stoked by a few political demi-gods masking as the face of the All Progressives Congress (APC), President Muhammadu Buhari’s party, the crisis has no ideological basis other than incurable personal greed for accumulation of the common patrimony. From 1999 when the current democracy came into, political gangsterism was alien to the peoples of Akwa Ibom. But a club and dagger politics was foisted on the state when Obong Victor Attah left office in 2007. The post-Attah epoch witnessed killings in the church, alleged state-organised abductions, enthronement of the reign of cultists and all forms of hitherto unknown societal vices. With the 2019 political battle all over the place, the rebels have been unleashed on the state, and the peaceful and investor-destination Akwa Ibom is sleeping no more because crooked power seekers are murdering sleep. An indicator of what is to come if the rend continues was ignited by the angry youths of the oil producing communities in state, the home axis of Governor Udom Emmanuel. They are protesting against the invasion of the state House of Assembly and in the process, disrupted the activities of ExxonMobile, an American oil major located in Eket Local Government Area. The youths blocked access into ExxonMobil facilities such as Airstrip, Housing Estate and Qua Iboe Terminal (QIT) in Ibeno. Such protests always impact negatively on oil production and government expected revenue. 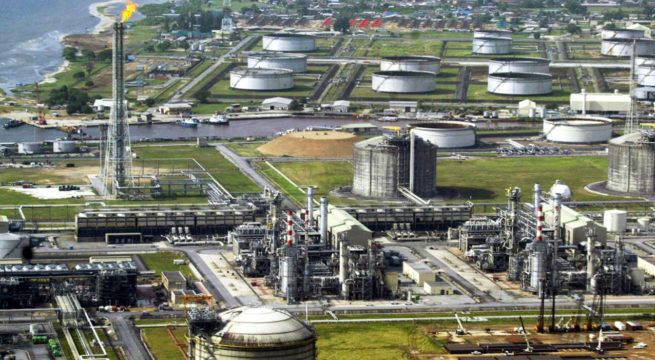 Eye-witnesses in Eket say as early as 7 a.m on Wednesday, the protesting youths stormed the oil facilities with placards carrying inscriptions such as “Crisis in Akwa Ibom is Crisis on the Nigerian Economy, “Sen. Akpabio Leave Gov. Emmanuel Alone”, “Eket Youths are Comfortable with Gov. Emmanuel”. “The people’s Might is mightier than so called Federal might”, “Our Crude oil is the mainstay of Nigerian economy”, “Akwa Ibom is Peaceful under Gov. Emmanuel. “The Commissioner of Police Must Go”, “We Won’t Succumb to Akpabio’s Warsaw Threat”, “You Cannot Change Government by Force, wait for elections among others. Their spokesman who is the youths Caucus Chairman in Eket, Tommy Enodien, said their peaceful protest was as a result of what was playing out in the state and ‘’ExxonMobil is the contact point to pass the message to Abuja’’, he said. According to him, ‘’we protested at ExxonMobil facility because it sustained the economy of Nigeria, so any disruption of their facility will attract the attention of the federal government. We have seen some people boasting that they have federal might but we are here to tell them that the people’s might is mightier than federal might. ‘’We are also here to send warning signal to Federal Government by drawing the attention to the fact that the crude oil that comes from here forms the mainstay of Nigeria’s economy. Akwa Ibom produces the highest quantity of that sustained the economy of the nation… crisis in the state is the crisis in the economy of Nigeria’’. Adding, he said the state will resist the Warsaw threat and ensure that Akwa Ibom remain peaceful, pointing out, for the past three and the half years, there has been relative peace in the state and that they want the peace to flourish. From Uyo, the state capital, thousands of Akwa Ibom women on Wednesday morning took to the streets demanding the immediate sack of the Commissioner of Police in the state , Musa Kimo. This is again coming as Governor Udom and Speaker Onofiok Luke have repeatedly accused the police of abetting the invasion of the chambers of the assembly by the ousted members and thugs allegedly hired by them. According to the commissioner, ‘’for the sake of peace in this state, we want the removal of Commissioner of Police, Musa Kimo from our state. We have always had peace, and we want that peace to continue. We cannot have a police force that will abet the level of illegality that we have witnessed in the House of Assembly. Introducing anything other than peace in Akwa Ibom is alien to our people. When there is crisis anywhere and women step in, there is always peace. This is why we have stepped in’’. Addressing them, Speaker of the House of Assembly, Onofiok Luke, charged the women to continue to pray for peace and to not be afraid but to rise at all times to defend our hard won democracy, pointing out that the state was peaceful until certain elements decided in August 2018 to declare “Warsaw” in the state. On Tuesday, five suspected members of the House with issues pending in court, Nse Ntuen, Idongesit Ituen, Gabriel Toby, Victor Udofia, and Otobong Ndem, allegedly led armed militias to attack the state assembly in what Speaker Luke described as the most scandalous desecration of the state legislature yet. During a plenary session, the House passed a seven point resolution ordering the immediate arrest and prosecution of those responsible for the break in to the chambers of the legislature and desecrating same. Other prayers of the motion which was moved by the House Leader, Udo Kierian Akpan, and seconded by the Deputy Leader, Ime Okon, in the plenary which had 21 lawmakers was a ban on the former members from going near the premises of the state assembly. They passed a vote of confidence on Speaker Luke for his leadership qualities and for standing by the provisions of the Constitution of the Federal Republic of Nigeria and the Standing Orders of the House; asked the Commissioner of Police and other security agencies to protect the institution of the house of assembly and its members and warning them to desist from aiding and abating the criminal activities of the sacked lawmakers. They also resolved to stand strong with Governor Udom to continue to build a peaceful and stronger Akwa Ibom, and urged the Inspector General of Police, Ibrahim Idris, to immediately redeploy the state commissioner of police, Musa Kimo, for aiding and abating the criminal activities of the five sacked lawmakers and for supplying them with over 50 policemen to break into the state House of Assembly.